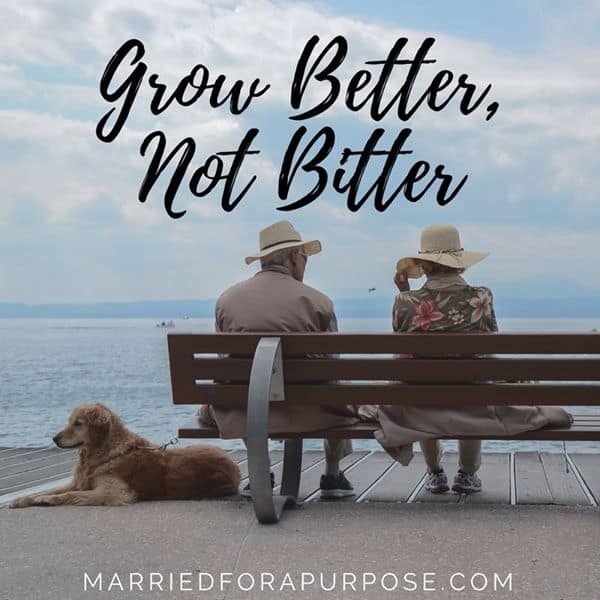 Don’t Grow Bitter … Grow Better! Early on in our marriage we carried a lot of unhealthy vows like: (Julie) I’ll never allow anyone to hurt me like that again! I’ll never be made a fool of! I won’t ever be that vulnerable again! (Greg) No woman’s gonna control me. I’m a grown man. I can do what I want. Little did we know, how significantly, those vows would impact and sabotage our life and marriage! It took a lot of effort to let go of those vows and it certainly didn’t happen overnight … as a matter of fact … we caused one another a lot of pain. We made a lot of blunders. Our choices led us to one final decision. We faced the question every couple must face at one time or another. Would we live bitter, or become better? Would we hold on to our offenses? Or, would we choose to forgive and let go of bitterness? It’s been written “To err is human; to forgive, divine.” Though not necessarily found directly within Scripture, this phrase is deeply profound and contains the key to a happy marriage. Despite our natural inclination to hold on to offenses, God commands each one of us to forgive, as He has forgiven. But…forgiveness can be tough. Oh, we may be willing to forgive, but find ourselves powerless to live out that forgiveness with complete freedom. We find ourselves trying to will away negative emotions of un-forgiveness, only to find it resurfacing when we least expect it. We understand that forgiveness is a choice and a mandate for marriage—but all too often we fail to be able to extend it, completely. So, the million-dollar question remaining is how? How do you overcome bitterness, and freely forgive? Submit your pain to God. Forgiveness isn’t easy…but it is liberating. If you feel a little stuck, but want your marriage to thrive, pick up a copy of What I Wish My Mother Had Told Me About Marriage: Unlocking 10 Secrets to a Thriving Marriage. We unpack specific insights on how to truly surrender your pain to God to experience incredible breakthrough. Remember God is your defender. He is faithful to protect. Don’t take vengeance into your own hands. God will protect far better than you can defend yourself. Ask for His intervention. Recognize you can’t control another person’s actions. Each of us will give an account for our own actions, not one another’s. Submit your life to the principles of God’s Word and allow Him to convict your offender. God, we know we’re not big enough but You are. We know we can’t but we trust that You can. Help us to take every thought captive to the cross and submit our spirit of timidity to YOUR endless authority and power. Fill us with FAITH and CONFIDENCE that YOU will NEVER let us down; we can trust in YOU! In Jesus’ name, amen.